I asked the shopkeeper what the price for the set was. “$300,” was her reply. I left that shop sad and wanting for something I had previously never heard or known about. I fell in love with those gorgeous pomanders that day and vowed to attempt to recreate the display myself. Much cheaper than craft foam balls, these can be purchased from your local dollar store for $1 each. I got mine at my local dollar store (www.dollartree.com) but for a wider range of colors, you may need to go to a specialty party store. To avoid frustration, I would go with a BIG bag of glue sticks because the last thing you want is to run out when you’re on a roll! This is to properly measure out the crepe paper strips. Step 1: Plug in your glue gun. While you wait for it to heat up, begin cutting the streamers into 24″ long strips. Step 2: Next, crumple each strip into a ball and then flatten back out. This helps make the streamers roll easier. 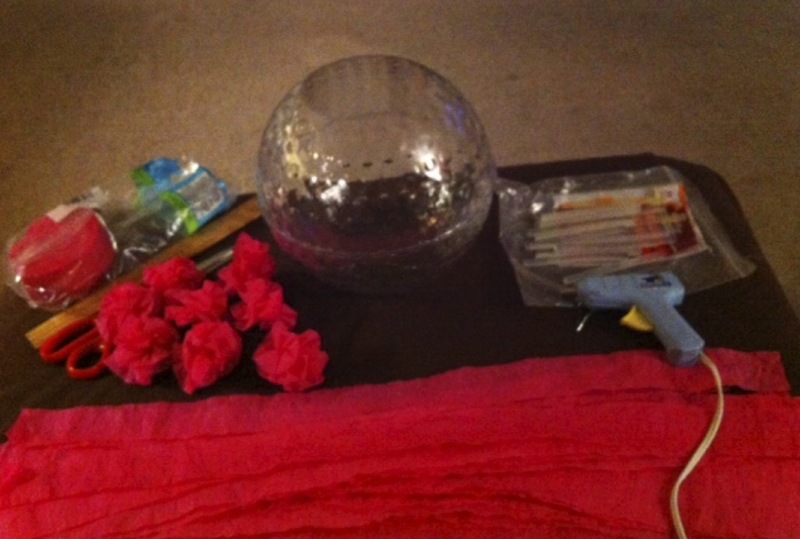 Step 3: Your glue gun should be ready to go now. Taking one of the plastic bowls, squeeze a drop of glue (about the size of a pea) on each opposite end of the outer rim of bowl (top, bottom, left and right). Step 4: Now, place the second bowl on top of the first bowl, rim to rim, creating a ball and gently press down so that the glue sticks both bowls together. Set ball aside to dry. Step 5 : Back to the streamers: Did you notice how the streamers have a concave curve to them from when they were wound into a roll when packaged? This convenient feature helps to make your flowers roll nicely and give them a rose-like look. So, keeping the concave side facing away from you, take the short end of the streamer and roll inward, pinching the bottom edge with your thumb and forefinger. Step 6: Pinching the bottom edge of the streamer together in your left hand, use your right hand to twist the length of the streamer away from you as you loosely bunch the streamer together around the inner roll in a clock-wise direction. Continue using your left thumb and forefinger to keep the roll from unraveling. Step 7: Add drops of glue to the pinched edge every 3-4 bunches or so to keep it from unraveling. Make sure not to bunch the roll too tight – you want a nice, loose-looking flower, right? Step 8: Once you have the entire streamer rolled up, add a final drop of glue on the pinched edge and twist. Then set aside to dry. Step 9: Repeat process until all streamer strips are twisted into beautiful little flowers. The looser the bunches, the bigger the flowers. Don’t worry if the first few you make are not perfect – they can be used to fill in the gaps on the ball and won’t be too noticeable once the ball is assembled anyway. 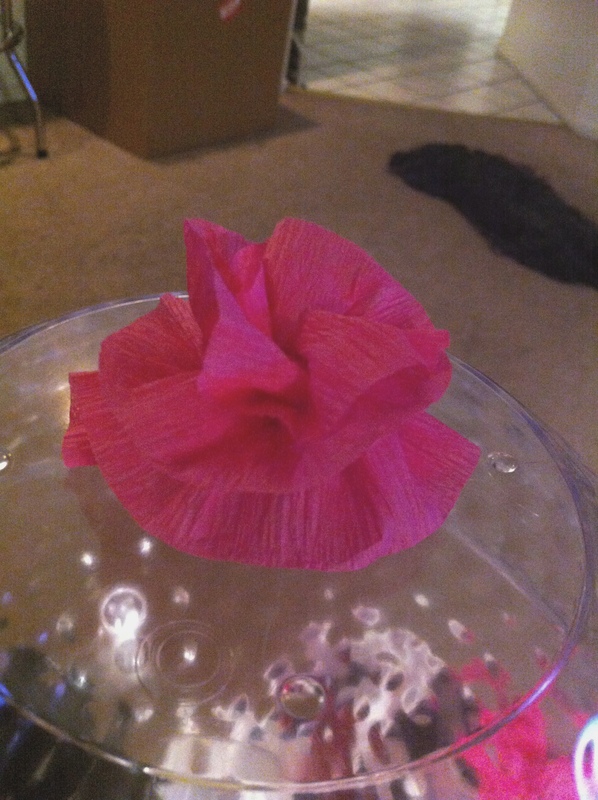 Step 10: Now that you have all your crepe paper flowers assembled, it’s time to glue them to your plastic bowl ball. 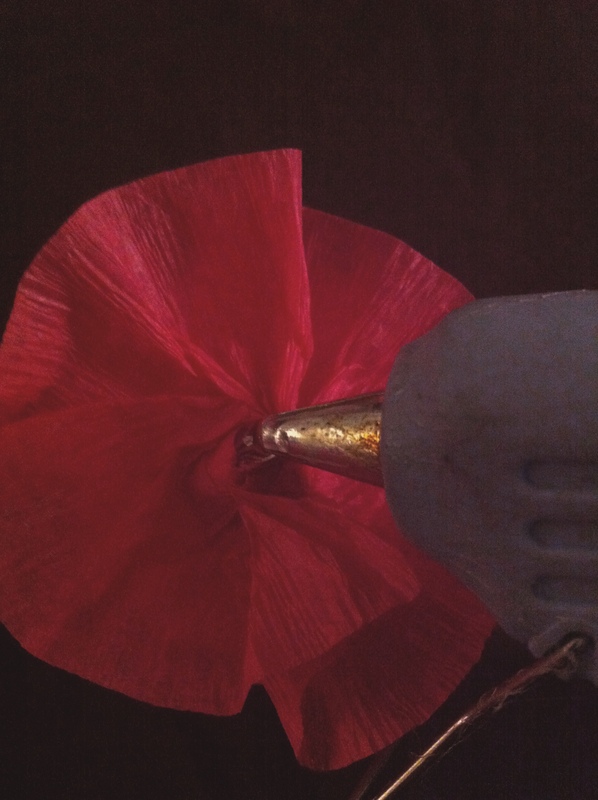 Take one of the flowers and snip off the twisted end and add a drop of glue in it’s place. Step 11: Stick the flower to the top of the ball. Continue to glue the flowers around the ball, spacing them out enough to not crowd each other but close enough to not let the plastic ball from showing. 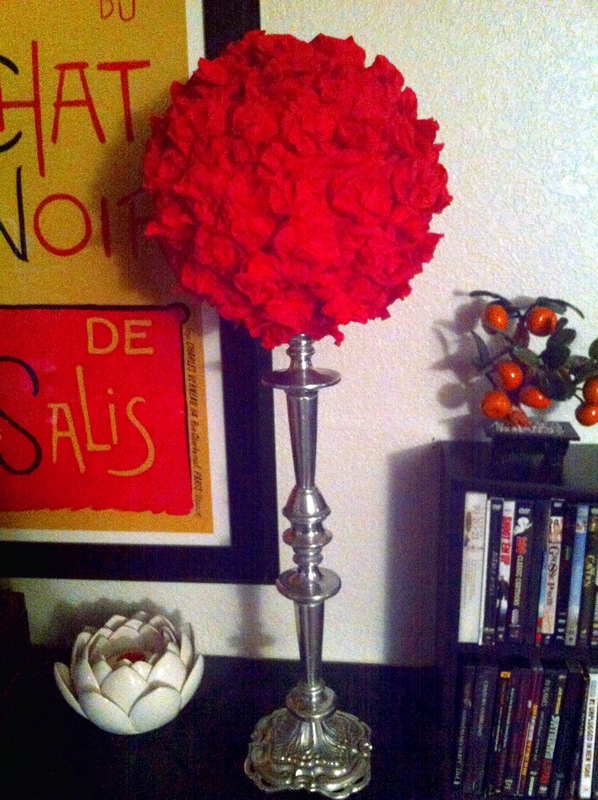 I used red crepe paper to make my pomanders. I stuck them to a pair of pewter candlesticks with some double-sided foam tape and used them to decorate my living room. Then, when a girlfriend of mine had a birthday party celebration, I made a bright pink pomander was able to easily remove one of the red pomanders and replace it with the pink one for her table setting. So you see how easy these are to make. Though a bit time consuming, they cost around $6, which is a MUCH better deal than spending $300! You can make many different variations of this using fresh or silk flowers instead of tissue paper. Though it may cost a bit more, it will save you the time of making the individual crepe paper flowers yourself. We invite you to share your own ideas on how to improve or modify this crafty idea in the “Comments” section below.